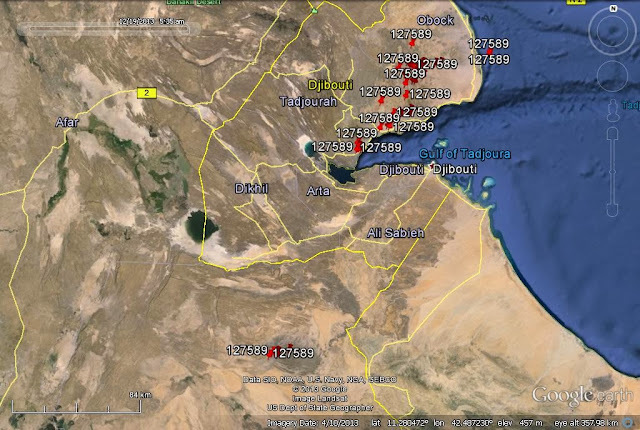 Egyptian vultures in Djibouti: Assamo: 1-17 December 2013. On 21 November Assamo moved back from the Ethiopian town of Adigala to northern Djibouti. See last post. He has moved around Obock and in the vicinity of Tadjoura (interestingly we have not yet recorded him revisiting the abattoir were he was first captured). Surprisingly, on 16 December Assamo returned to Adigala. Also, on 30 November there were two interesting locations over the sea about 5 km from land. Vultures are soaring birds and in general avoid flying over large areas of open water because these places normally do not have strong thermal updrafts. Also, this is not migration time. Assamo's movements during late November - early December. The southerly cluster of locations is around Adigala.